Infinity Expedition is an ongoing journey aboard Infinity, a sailing expedition vessel traversing the Pacific Ocean. We travel from port to port, doing environmental projects along the way and keeping an eye out for what adventures await! Infinity is a 36m (120ft) sailing expedition vessel. 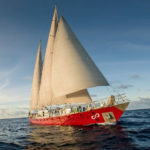 We sail around the Pacific, primarily the southern islands, doing environmental and adventure projects. We offer a range of activities from SCUBA to sailing lessons. Infinity travels primarily off the beaten path, seeking unexplored regions of the world. Infinity is currently in dry-dock in Manila in preparation for the next several years of our journey, especially our projected 2017 goal of traversing the Northwest Passage. We are running an auction to help support these efforts, details available on our website.